A member of the so-called White Helmets which has been hailed by the western media as ‘peace-bearing heroes’ has been caught on camera helping a group of unidentified militants disposing the bodies of beheaded Syrian Army soldiers. Graphic footage posted on Twitter on June 20 shows a man wearing a T-shirt with the White Helmets logo dumping a pile of bodies, allegedly being that of Syrian Army soldiers or pro-government fighters. The gut-wrenching footage shows that many bodies in the pile are beheaded and one militant even shows a severed head of a soldier up close on camera. “Impartial and humanitarian White Helmets [are] participating in the beheading and throwing of Syrian soldiers bodies at a dumpster in Daraa,” a caption under the video posted on Twitter reads. Daraa is a southern Syrian province bordering Jordan where several rebel factions as well as Al-Nusra terrorist group and its affiliates are operating. It remains unclear which militant group was shown in the video disposing of the bodies. Following the incident, the White Helmets, officially known as the Syria Civil Defense, were quick to release a statement, in which the group’s management condemned the man shown in the video and said they fired him for violating their code of conduct. “As a result, the volunteer has been dismissed,” the statement says. 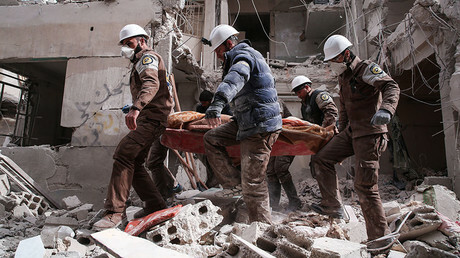 In one such incident in May, footage emerged showing several members of the group’s rescue team helping to get rid of a body of a man shot dead by rebels in the town of Jasim, also in Daraa province. 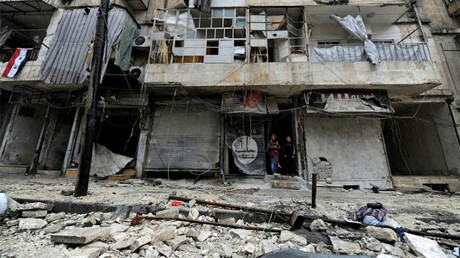 The man was shot during a summary execution carried out by the rebels in front of a large crowd and recorded on camera. The video then shows volunteers from the White Helmets moving in to dispose of the body, Almasdar news website reported at that time. At that time, the issue appeared to be the fact that the group’s local team leader failed to seek “permission from his superiors before agreeing to the request” to dispose of the body. He was later dismissed. The White Helmets have long been hailed by the mainstream western media as heroes who save lives. A Netflix documentary film praising the group as “unarmed and neutral civilian volunteers” even won an Oscar for best documentary short feature in February. However, the group has long been plagued by allegations of having ties with terrorist groups. Russia's Foreign Ministry spokeswoman, Maria Zakharova, said in April that the White Helmets are involved in covering up terrorist’s crimes. “The White Helmets not only feel at home on territories controlled by Al-Nusra Front and Islamic State [IS, formerly ISIS/ISIL], but also openly express positive attitudes towards them, providing them with information and even financial assistance,” she said at the time. She went on to say that the “White Helmets is a major construct funded by the UK, the US, the EU and the Gulf States that promulgates the propaganda against the Syrian government and the Syrian Arab Army” and that can partly explain the media silence when such scandals emerge. 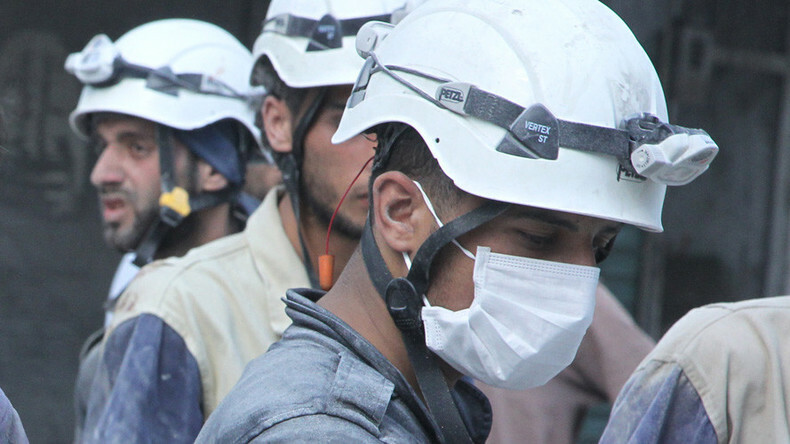 A Canadian journalist and rights activist, Eva Bartlett, who has traveled to Syria numerous times since the start of the war, has also questioned the authenticity of the White Helmets’ claims concerning their ‘rescue effort’ mandate. Members of the group “purport to be rescuing civilians in eastern Aleppo and Idlib [but]… no one in eastern Aleppo has heard of them,” she said in an address to the UN in December 2016.